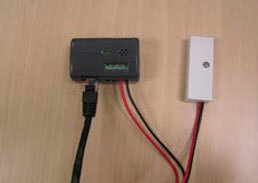 The SSL-VIBRATION sensor is a device, which connects to the SSL-EMD. When a vibration is detected an alarm will be initiated. Through the SNMP-SSL card, the user can monitor it and receive notifications of the alarms. SSL-VIBRATION sensor is designed for protecting against forced entry by hammer, saw, crowbar, etc. through walls, ceilings, windows, safes, cabinets, etc. It is used it in closed-circuit alarm systems and will initiate an alarm when a vibration of considerable force strikes the protected surface.